Cyber Essentials – how the 5 controls will help protect your business. Cyber Essentials is a government backed scheme. It is designed to be a first step to help organisations to protect themselves from 80% of the most common internet threats. It covers five important controls areas. 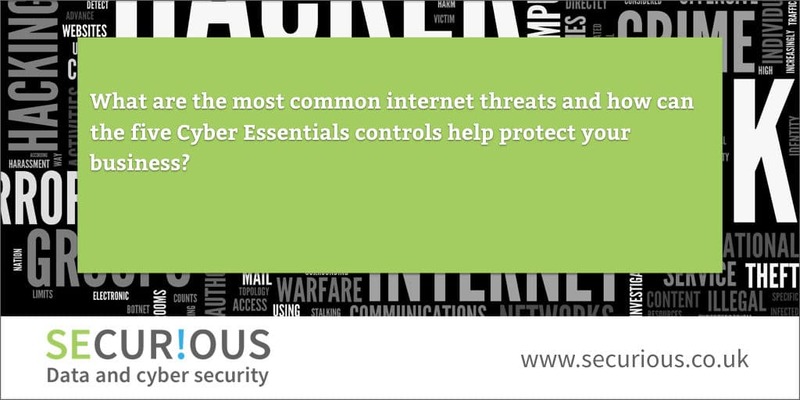 What are ‘the most common internet threats’ and how can the five Cyber Essentials controls help protect your business against them? What are the most common internet threats? Hackers – people who try to access your systems for the fun or challenge. Not necessarily highly skilled. Employees – have legitimate access to your systems and could be a threat either accidentally or through deliberate misuse. Hacktivists – those who target companies for idealogical or political motives. How are the most common attacks carried out? There are readily available tools on the internet which allows you to scan for vulnerabilities which can be exploited. This is similar to a thief doing a survey of a neighbourhood to look for the best opportunities, unlocked doors, open windows, empty properties, no alarm systems etc. Most attacks start with a survey to look for weaknesses. Other surveys could be through looking at social media accounts such as Facebook and LinkedIn to pick up clues such as easily guessed user names and passwords and may be more targeted. Many attacks are aimed to target as many devices, services or users as possible by using the ‘openness’ of the internet. Attacks such as these will use emails designed to trick users to visit a fake website, download malicious code etc. These are effectively how you protect your perimeter. So for the thief carrying out his survey, they will be the locked doors and closed windows requiring more effort to get around to gain access. Boundary firewalls and internet gateways determine who has permission to access your system from the internet and allows you to control where your users can go. This reduces the functionality of each computer or device to the minimum required for that user to operate. This will help prevent unauthorised actions being carried out. It also ensures each device discloses only the minimum information about themselves to internet. A scan can reveal opportunities for exploitation through insecure configuration. It is important to restrict access to a minimum. This is to prevent a hacker being presented with a series of unlocked doors allowing him access to all the information he is looking for. Administrator rights are the Holy Grail for a hacker. Once he has possession of these he can effectively go everywhere and has full control. Administrator rights should be restricted for only administrator actions. Convenience sometimes results in many users having administrator rights and therefore creates opportunities for exploitation. It is important to protect your business from malicious software which will seek to access files on your system. Once there software can access and steal confidential information, damage files or even lock them and prevent you accessing them unless you pay a ransom. Malware protection helps to identify and prevent/remove any potential threats from malicious software. Cyber criminals often exploit widely known vulnerabilities in software or operating systems to gain access. These could be through poorly designed software which have known weaknesses. Updating software and operating systems will help to fix any of these known weaknesses. It is crucial to do this as quickly as possible to close down any opportunities which could be used to gain access. Who is Cyber Essentials for?